In April, my daughter and I spent a week in Ireland, mostly on the west coast in Connemara (County Galway) and the Burren (County Clare). We got used to left-side driving on the new highway between Dublin and Galway. We were amused by the GPS showing that we were driving across fields rather than on any road; obviously the mapping had not yet been updated. 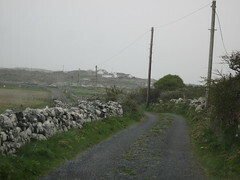 Connemara is a wild landscape. Electricity and cars did not become established until the latter half of the 1900's. With the real estate bubble, however, new houses have sprung up and tourists are more common. 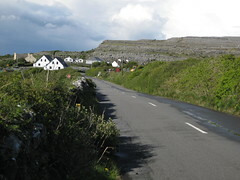 The local roads haven't changed, bordered by hedgerows and rock walls. Sheep and Connemara ponies populate the fields, and even run loose, creating occasional driving obstacles. The host at our B&B in Fanore (County Clare), Noel, drives a scheduled passenger bus, going from Doolin (a little bit south of Fanore) to Galway City. I told him that I was impressed with the brinksmanship that the buses engaged in on the narrow roads causing the oncoming traffic to edge over to the left as far as one dares, slowing or stopping if necessary. These are often gorgeous, unblemished behemoths that come at you with a certainty that you WILL get out of their way. I pointed out that these buses are often driving over the line (where there is one) taking up more than their fair share of the road. Obviously, they intend to remain unblemished and let the foreign yokels pay for the scratches that are inevitable as you sidle up to the hedgerow and rock walls. Local farmers are not very friendly on the road either. We were poking around on a one-track road, when all of a sudden we were faced with a modern John Deere with a front-end loader right in our face. It was very clear that he was not going to back up. Backing up is not my favorite thing, but I slowly moved in reverse with the farmer creeping right up on my front, just so I could remember he was there. We finally were able to get off on the side and he roared past. Needless to say, one-track road driving is not for the faint of heart. Noah's sage driving advice was to engage in one's own bit of road intimidation by always leaving at least a foot of space on the left side of the car. You have a place to move to if you absolutely have to, but maybe you can get the oncoming traffic to move over instead. Is there is relevance for life in general in that advice? I broke my fibula bone near my left ankle two weeks ago. Since then, and for three more weeks, I need to keep my weight off of my left leg. So, I am experiencing what others cope with for much longer, or for even most, or all, of their lives. I find people want to help. This is refreshing, and I am pleased that people do want to help. However, I am trying to get around by myself, and working hard to do it without help. I am happy that my muscles are getting stronger, particularly in my upper body and my right leg. They aren't going to get stronger if I sit in a wheel chair, and my crutch skills aren't going to get better if I don't use them. (I hate the crutches and consider them a treacherous but necessary evil.) So, I try to be the "happy warrior." I will ask when I need help. Perhaps the best thing to ask is "How are you doing? Is there anything I can do to help?" And, don't be upset if I say "No." I appreciate the opportunity to work at home all week and engage in a forced slowdown. Interestingly, I am actually able to be more productive. (I am a consultant and am fully outfitted with the necessary electronics.) It has not taken much to set up the house so I can work, eat, and even cook a decent meal. I am unhappy about not being able to spend time outside -- work on my garden, walk around, and soak in the sun (at least when it is sunny). At this point, I actually wouldn't mind a few bug bites, although I am concerned about having a tick crawl under my cast and gorge on my emaciating leg. I am learning about how difficult it is to get around as a handicapped person. Despite years of ADA adjustments to sidewalks, parking lots and buildings, I find I must make a clear-eyed assessment of what I have to deal with at a particular site. I am finding that the handicapped parking places may be all full, leaving me to hike in on my crutches, in the rain, from a far corner of a parking lot. Or that the handicapped ramp may not be very near a door. Or that there is not a curb cut at all at a small strip mall, like the one that has my favorite Asian store. So, in three weeks I will have a walking cast, and my interregnum will end. Maybe I won't rush back into the pre-broken foot lifestyle.